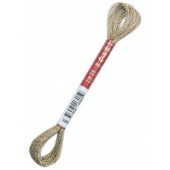 Anchor Astrella metallic embroidery threads - available in 2 colours, antique gold and silver. Each skein contains 10m of 50% polyester / 50% metallised polyester metallic embroidery thread. Anchor Astrella is a metallic textured thread, ideal for couching and embellishing your needlework.